“It is good to see you in the dark,” was our cryptic evening welcome from Omri Nene, a Zulu named after a Biblical king. The original Omri became king by the choice of the people of Gibbethon after the smiting (by Omri, I think) of Zimri. It’s not a common Zulu name, but then Omri is not a common Zulu . He is a tour guide, not of the battlefields of Judah in the ninth century BC, but of the Anglo-Boer War near Ladysmith in 1899. And he is a globetrotting actor. He had been accompanied here in the dark by the silhouettes and the barking of three baying dogs of war. The Drakensberg can conjure up nightmarish visions of Family Fun, Bingo in the Bar and Deck Quoits, but we weren’t in the Drakensberg. We were at the nearby Three Trees at Spioenkop, where we planned to ride horses, spot birds, walk dogs and eat a lot. We hadn’t planned to go shopping or to a Drakensberg Boys Choir gig, but we did those as well. In the best conventions of the new dispensation, Omri is a dispassionate observer when recounting the tale of the battle of Spioenkop. In our group, his version appealed just as much to the handlebar- moustached British general as it did to a couple of buzzing Pretorian youths of the De Le Rey new generation. “I am in charge here,” he bellowed, becoming (temporarily) Lieutenant Colonel Thorneycroft. “There’s no surrender. Take your men back to hell, sir, where they came from!” It was a consummate performance. Three Trees was once a member of the David Rattray stable but was recently taken over by safari stalwarts Simon and Cheryl Blackburn. It is now so much more than a battlefields lodge. They offer exemplary mountain hospitality without the enforced camaraderie of a big family oord. You’ll meet like-minded guests on undulating walks followed by eclectically entertaining meal-time conversations. It’s life in the berg, bush and battlefield, to a backdrop of tasty soups and meaty roasts, not to mention a strudel that would have had Mozart asking for another coffee and a second slice, before heading for the highlands to hum a tune and walk it off. When the mist lifts from the mountain-tops, the lodge’s views, from stoeps and baths alike, stretch over the Spioenkop Game Reserve, heaving with giraffe, eland, hartebeest and rhino. When last did you see a rhino from your bath? The horse rides have the same views but from closer up and without the bubbles. All the lodge’s established traditions survive under the new owners. The rooms are comfortable, in period design, with quirky antique ads for Bovril and Keen’s mustard (both of which apparently kept the British troops alive in the diseased African veld just over 100 years ago). Three days after Omri’s welcome, we bade our hosts, their hounds and our Zulu king farewell. We were no longer in the dark but enlightened. We were more than alive. Truth be told, we were as keen as mustard on Three Trees, foothill hospitality at its finest. Craft shops and coffee stops are sprouting up everywhere you look on the labyrinth of roads in the foothills of the Drakensberg, a kind of Midlands Meander in the clouds. Try this for a day out in Champagne Valley. Get wax and woven stuff at KwaZulu Weavers Rug and Candle Factory on the R600 outside Winterton. Telephone: 036-488-1657. See Goodman Khumalo, the strumming minstrel, and a range of trendy art, decor, culture, craft and clothes shops in Thokozisa on the R600. Telephone: 036-488-1207. Look at pots, dishes and plates at Ardmore, ceramics favoured by P resident Thabo Mbeki, Britain’s Queen Elizabeth II, Princess Caroline of Monaco and actress Angelina Jolie. Open seven days a week. Telephone: 033-234-4869. Lunch at Valley Bakery, where everything’s home-made including bread and fillings, biscuits and cakes galore. Monday to Friday and Saturday mornings. Telephone: 036-468-1257. Watch a lively and uplifting performance by the Drakensberg Boys Choir featuring Bach, Faure and Freddie Mercury. Yes, really. And an African selection to stir the worst cynic. Most Wednesdays. Phone: 036-468-1012. Where it is: In the lee of the Oliviershoek Pass, below Spioenkop, between Bergville and Ladysmith. Why go there: Walks, talks, climbs, rides, swims, game-filled valleys. All the major walks of the Northern Drakensberg are less than an hour’s drive away. What it has: Six en-suite rooms, one family, three dogs, one actor and a team of friendly Zulus. What it�s like: Family-run, affordable, intimate, accessible. And the food: Locally sourced and grown, meat, veg, milk and eggs. No imported kiwi-fruit. No carbon imprint. Legendary lentil curry. 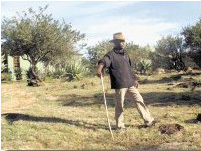 Rates: In winter: R795 per person including all meals and guided walks. High season, R1350 per person . Ask for kids rates. Tours, rides and drinks charged separately. Getting there: 8km on the D564, off the R616 between Bergville and the N3 highway. What there is to see on the way: The ever-approaching backdrop of the magnificent Drakensberg range. Shopping, shopping, shopping. Contact: Simon and Cheryl Blackburn on 036-448-1171 or 082-379-1864. E-mail reservations@threetreehill.co.za or visit www.threetreehill.co.za.